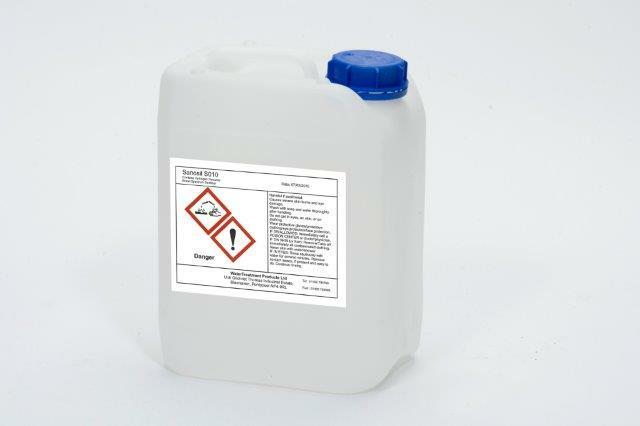 SANOSIL S010 is a disinfectant concentrate for professional users, suited for surface, aerosol and water disinfection. SANOSIL S010 is preferably used for water and/or pipeline disinfection. The active substance used in SANOSIL S010 is hydrogen peroxide. The active substance is stabilized and boosted with silver, thus achieving a greatly improved effectiveness against micro-organisms. The traces of silver remaining on the treated surfaces are not visible. However, they efficiently inhibit a renewed contamination. The elemental oxygen (O2) separated by the hydrogen peroxide attacks the cell walls of the micro-organisms directly. The chemical reaction between the oxygen and the cell wall molecules will cause these to be denatured and destroyed. This effect is intensified by the silver ions which form a bond with the disulfide bridge of certain proteins of micro-organisms, thereby inactivating or precipitating these proteins. The diluted solutions of SANOSIL S010 are particularly well suited to the disinfection of contaminated surfaces. Soiled surfaces should be previously cleaned in order to ensure perfect disinfection. The better the cleaning procedure (for example with high pressure cleaner, brush and soap water) the more effective the subsequent disinfection. SANOSIL S010 should be dosed according to the specific application method sheet. Effectiveness: Bacteria, viruses, yeasts and fungi, bacterial endospores, biofilm. Sanosil S010 undiluted is a powerful oxidising agent. It is heat sensitive above 60ºC – spontaneous decomposition may occur. Contact with brass, bronze, chromium, copper, iron, lead, manganese, nickel, silver, zinc and other catalytic metal will accelerate decomposition. Contact with concentrated acid, alkalis reducing agents, dirt, ash, rust or metal dust will also cause spontaneous decomposition. Therefore these materials must be absent in transfer pumps and pipework. (Please refer to Safety Data Sheet for detailed handling and storage information).